The Complete Guide to Teaching Students with Aspergers and High-Functioning Autism is a downloadable eBook designed to assist teachers in developing a set of teaching strategies specific to the student on the higher end of the "autism spectrum." This eBook is great for parents who homeschool their child, too. Aspergers is a condition on the autism spectrum that generally encompasses high functioning children with autistic tendencies. A child with Aspergers can have difficulty in school because – since he fits in so well – many adults may miss the fact that he has a diagnosis. When these children display symptoms of their disorder, they may be seen as defiant or disruptive. When teaching Aspergers students, a teacher should be aware of their special needs and accommodate both her classroom and teaching strategy to support the students’ special needs. Aspergers is a label – but a label is never helpful unless it helps you better support the student. Knowing what works and how to program is key. 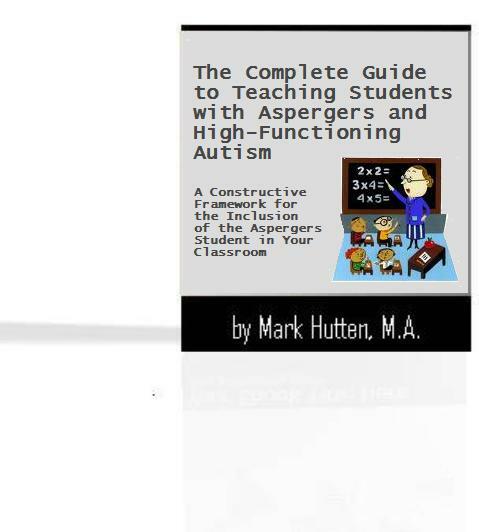 In The Complete Guide to Teaching Students with Aspergers and High-Functioning Autism, teachers will obtain an in-depth understanding of what an Aspergers student needs and how to support him or her. Adjust your Strategies— If you have a child with Aspergers, adjust your teaching strategies to accommodate him. Many times, students with this disorder see things in a very concrete way. If the “Aspie” raises his hand and the teacher responds that she will be with him in 5 seconds, he may very well announce when the 5 seconds have passed because of the concrete way he thinks. The teacher will have to learn to be precise in what she says and use concrete materials rather than abstract ideas whenever possible in her lessons. Create a Supportive Environment— It will be extremely important for a teacher of an Aspergers student to create a supportive environment where he can thrive. If he is in an integrated classroom, this may mean helping the other students understand his special needs, pairing him with a buddy, and having a consistent predictable schedule as part of the daily classroom routine. The teacher may also want to create an area where the Aspergers student can go to and calm down if he gets overwhelmed with a given activity. Plan Ahead— Students with Aspergers can have high levels of anxiety, which makes changes in routine and unpredictable events difficult for them to handle. A teacher should plan well ahead and give the child plenty of advanced notice if a change in routine will occur or a new subject will be taught. Test the Student— Children on the autism spectrum often display what is known as “splinter skills” (i.e., they may excel in one area, even beyond their age level, and yet severely delayed in other areas). For this reason, it is important for a teacher of a student diagnosed with Aspergers to have him tested in all of his skill areas. It should not be taken for granted that a child who excels in math will also excel in reading. learn the warning signs that the “Aspie” is being overcome with frustration and about to experience a "meltdown"
Money-Back Guarantee: If you’re not satisfied with The Complete Guide to Teaching Students with Aspergers and High-Functioning Autism after examining it for 30 days, just email me [mbhutten@gmail.com] and I’ll gladly refund your money – that’s how confident I am that these teaching strategies will help you in educating your challenging Aspergers student. STOP! Watch this brief tutorial on "Purchasing and Downloading eBooks Using PayPal" first. Aspergers students exhibit significant social communicative difficulties, as well as other defining characteristics, which may severely impact their ability to function successfully in the school setting. But, when given appropriate support strategies, through direct teaching and various accommodations and/or modifications, the “Aspie” can learn to be successful in her unpredictable, sensory-overloading, socially-interactive world. It is critical that a team approach be utilized in addressing the unique and challenging needs of a child with Aspergers -- with teachers being vital members of this team! Armed with the information in The Complete Guide to Teaching Students with Aspergers and High-Functioning Autism, teachers will begin to build on the Aspergers child's strengths to help him modify his "out of the norm" behaviors and make a lot of positive contributions to the class. Having a student with Aspergers in your class gives you the chance to show your students that people who have challenges can also have strengths -- that in looking past someone's quirks, you can find someone worth knowing -- that life is richer if you don't solely interact with children who are like clones of yourself. Partitions around learning stations and computer centers are great for creating visual blocks on both sides of a student and can also cut down some noise. Classroom walls can be over-stimulating and “busy” with decoration. If visuals cannot be streamlined, at least keep them somewhat static so the Aspergers student can become accustomed to them. Helping the Aspergers student maintain some element of ‘structure’ during relatively ‘unstructured’ times can be quite helpful. 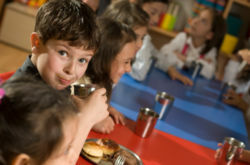 For example, an alternative to being swallowed up by the lunchroom crowd would be to establish “lunch-time discussion” tables in a quieter corner of the cafeteria. Ensure that the Aspergers student has advance knowledge of schedule changes outside of the routine, such as early dismissal or assemblies. Focus on natural lighting instead of fluorescent lights when possible, using fewer overhead lights or adding alternate lighting such as floor lamps. Give the Aspergers student advance notice of fire-drill times so that he may brace himself for the noise. If he cannot tolerate it, small foam earplugs may help, or wearing iPod or MP3-player headphones may diffuse the noise. Hallways can become extremely noisy (e.g., the echo of footsteps, load conversation, etc.). Wherever possible, keep classroom doors shut. Numbering classroom rules as written reminders for the Aspergers student is a good idea, but publicly displaying them on a desktop is stigmatizing. Tape them inside the student's notebook or binder and refer to them discreetly. The volume of the PA system in the room may be too loud. If it's possible to adjust the volume, this can help (same for the change-of-class bell). This is my first year teaching in a public school (5th grade), and I was ready and willing to accept help wherever I could find it. Then when I discovered I was going to have a student with Asperger Syndrome in my class, I looked for information on this disorder and ended up on your website. I downloaded your ebook, printed it out, and read it 3 times over the course of a few weeks (during my lunch breaks). I had researched AS on the Internet, but only found generic tips that were really not very applicable in “real-life” circumstances. But now that I have your “proven” strategies, I find myself to be a bit of an expert in teaching the child with an ASD. Thanks so much. -- Michael T.
Reading your ebook refreshes my idea that I'm doing a good job as a special education teacher. I have incorporated many of the recommendations into my classroom with great results. I have used your teaching techniques to help me see each day as a new opportunity to help my Asperger child succeed. -- K.H. After teaching for 19 years, it is both inspiring and comforting to learn that you can “teach an old dog new tricks." Sometimes it helps to look beyond the problems that you have in your classroom and look at what you are doing yourself – and how what you do may not help change behavior. I felt inspired and empowered by your eBook. Parts of it affirmed what I held true about students with Asperger’s Syndrome, and other parts empowered me to make changes – even with my “neurotypical” students. Thanks! -- S.R. I have far more confidence, skill and understanding of Asperger Syndrome and High-Functioning Autism now than before I discovered your guide. I had done a lot of research on this disorder, but could not find any real concrete, step-by-step methods for teachers – until now. There’s a lot of helpful information for parents but not much information for teachers. Thanks for your support and email correspondence. -- Andrew, grateful teacher in the U.K. I teach middle school kids. I have a poster that reads "How can I make a difference?" above my desk in the classroom. I'm aware of my strengths and weaknesses like never before in my 9-year teaching career - all thanks to you! My Aspergers students LOVE the “Caught-You-Being-Successful” Award. The award-bucket was full on Friday. I am using them to reinforce their homework routines for reading comprehension. It is working like a dream! Thanks for sharing your expertise. -- Francis J.
just email me at mbhutten@gmail.com for a 100% prompt and courteous refund. call 765-810-3319 or email mbhutten@gmail.com. download time is only about 30 seconds. Don't like sitting at the computer to read? No problem! Simply print a copy of the eBook and take it with you. About the Author: Mark Hutten, M.A. is the creator of Online Parent Support. He is a practicing counseling psychologist with more than 20 years’ experience. He has worked with hundreds of parents, children and teenagers with Aspergers and HFA, and presents workshops and runs training courses for parents and teachers who deal with Aspergers and HFA. Also, Mark is a prolific author of articles and ebooks on the subject. TeachingAspergersStudents.com. Simple theme. Theme images by luoman. Powered by Blogger.